Company: College and More, Inc.
FAIRFIELD, CT, March 1, 2012, Dr. 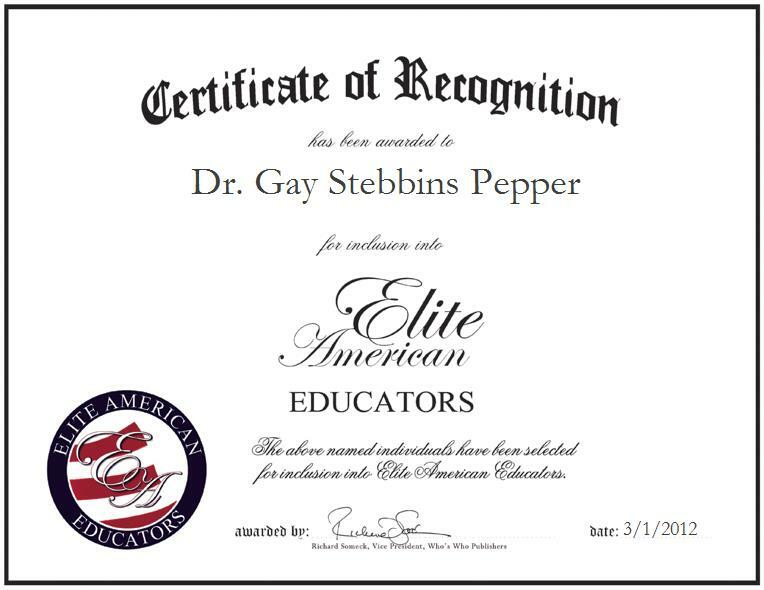 Gay Stebbins Pepper, Founder and Director of College and More, Inc., has been recognized by Elite American Educators for dedication, achievements, and leadership in educational counseling. Dr. Pepper specializes in college counseling and admissions, and in her current capacity, she works with families who request guidance to help their children choose boarding schools, colleges, professional programs, or graduate programs. She also offers a lecture series on competitive college admissions through Westchester and Fairfield counties. Dr. Pepper has always believed that a good teacher, mentor or counselor can have an enormous impact on a student’s life – a lesson that has been true in her life and in the lives of others with whom she works. Very few students start out feeling confident that they will achieve success; this confidence comes step-by-step. Early on, if a teacher tells someone, “You can do it. I believe in you,” they feel validated and begin to believe that they can achieve the goal at hand. Receiving this kind of encouragement is what builds self-esteem and makes students reach for a higher goal that sometimes seems unattainable. That is what happened to Dr. Pepper in her senior year at Stanford University, when famed German History Professor, Dr. Gordon A. Craig, informed her that she was going to graduate school to earn a Ph.D. in history, something that she had never considered. His conviction that she could be successful is what inspired her determination to succeed. The same was true when she went from teaching at the Dalton School to completing her doctorate at Columbia University. It was the Headmaster, Donald Barr, who took her to meet the key professors who made this happen. It is this kind of self-fulfilling prophecy that is the key to Dr. Pepper’s success in the profession of college counseling. Following careful analysis of a student’s academic and personal profile, and a discussion of career goals and personal interests, Dr. Pepper is able to put together a dynamic list of colleges that are ideally suited to match that student’s aspirations. They analyze exactly what the next steps are needed to make that reality happen, whether it is participating in summer enrichment, improving test scores, or taking more challenging courses. Then they put together a preliminary college list, which is always customized to fit the individuality and strengths of the student. The colleges are grouped in three categories: “reach” -ones that will require additional achievement to be admitted; colleges where chances of being accepted are “50/50” or better; and “back-up” colleges, where admission is highly realistic. Giving a student a sense of confidence about college options takes great expertise and human understanding. Not only does one have to understand the unique strengths of individual colleges, one also needs to have a feel for the personality of the college and the kind of community it represents. Then one has to understand the personal dynamics of the student and what kinds of colleges represent a good match for that individual. Pulling all of this together is what makes for a successful college counselor and a successful college student. Dr. Pepper believes that having a college experience that stretches students intellectually and helps them achieve independence and self-awareness is a great gift that can prepare them for success in life. Helping others achieve that gift is why she feels that her college counseling practice is as much a calling as it is a profession.